Our problem with these metrics is that they don’t say much about the storage systems performance. 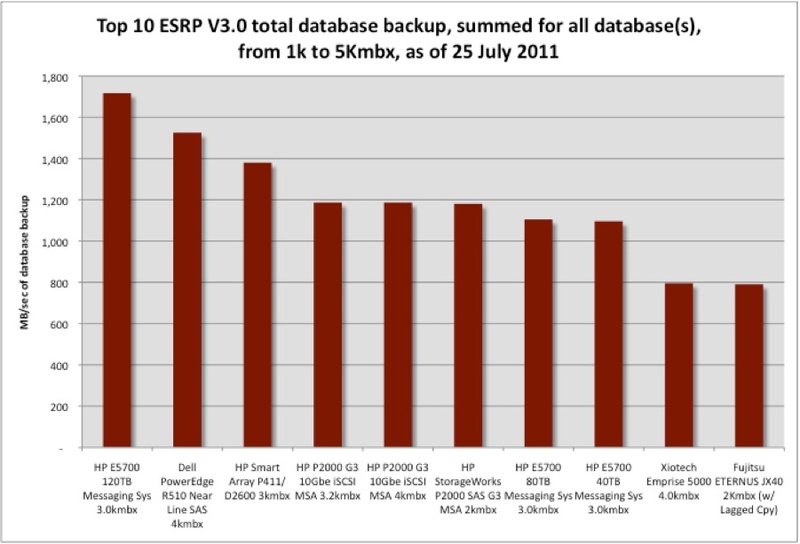 Some ESRP submissions could have a single database while others can have 100s of databases. And the same thing applies to servers, although 20 servers seems to be about the max we have seen. So as one can see the MB/s/DB or MB/s/server can vary all over the place depending on the Exchange configuration that one uses, even for the same exact storage system. In the above chart, we have attempted to move beyond some of these problems and use the information supplied in the ESRP reports to aggregate DB backups across all databases. As such, we have derived a new metric called “total database backup”. (Pretty simple actually just multiply the MB/s/DB times the number of databases in the Exchange configuration). A couple of problems with our approach. Current ESRP reports typically utilize a shadow storage system and shadow Exchange servers which host 50% of the databases and email activity. So what I am showing for those ESRP reports is what two storage systems can accomplish not one. Another potential way to get the same result would be to use the number of servers times the MB/sec/server metric. (But try as I might these two approaches didn’t work to get the same answer so I am using the computation above – must be the way I am recording the number of [shadow] servers). Although ESRP reports the average MB/sec/database to backup a single database it’s not clear that these measurements were taken while backing up all active databases at the same time, especially for those submissions with 100s of databases. Probably the last is the most problematic critique to our new measure but may not be that harmful for smaller configurations. Nonetheless, we produced the above chart and published it in our last months review of ESRP results for the 1001 to 5000 mailbox category. One item we discussed in our report was that numbers of disk drives didn’t seem to correlate well with high positions on this chart. The number ten position (Fujitsu ETERNUS JX40) used over 140 disks, the number two position (Dell PowerEdge R510) had only 12 disk drives, and the number one solution (HP E5700) consisted of 56 drives, close to the average for this category. One striking finding using this measure is that performance varies considerably from the top providing over 1600 MB/sec of database backup to the lowest of the group providing only ~800 MB/sec of backup performance. What with Exchange 2010 and lagged DAGs, some people feel that backup activity is no longer needed but we would disagree. We continue to believe that taking backups of Exchange data still makes a whole lot of sense and shouldn’t go away, ever. It’s our hope that this or some similar follow-on metric will remove some of the Exchange configuration parameters from confounding ESRP reported storage system performance results. We realize that this quixotic quest may never be entirely successful nevertheless we perform this duty in the hope that it will benefit today and future storage performance analysts everywhere. The full ESRP report went out to our newsletter subscribers last month. A copy of the full report will be up on the dispatches page of our website later next month. However, you can get this information now and subscribe to future newsletters to receive these reports even earlier by just emailing us at SubscribeNews@SilvertonConsulting.com?Subject=Subscribe_to_NewsletterR or using the signup form above and to the right. As always, we welcome any suggestions on how to improve our analysis of ESRP or any of our other storage system performance discussions.